Three months after it was revealed, in May’s election, the escalation of the Fascist threat, and while the far-Right junta which governs us is systematically nourishes racism in order to pass on the immigrants the sins of the bankers, we witness serious indications of a society which wakes up. It is not surprising that these indications originate in the base rather than the top of the society. 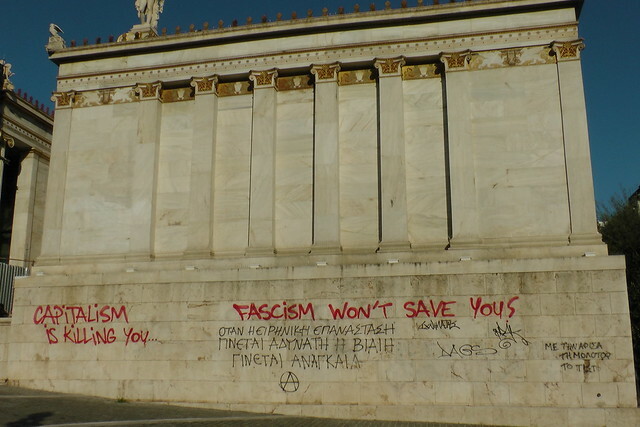 These processes seem to have progressed especially in places where antifascist fronts have been formed such as the Greek cities of Kavala, Rethymno and Korinthia. By choosing a historical perspective we could view these efforts for the creation of local “united fronts” in contrast to the wider “popular fronts” , the latter usually including non-left forces as well and for this reason usually interrupting radical intensions of the base. The historical experience indicates that the united fronts are a necessary element of the strategy with which Fascism is resisted, and that what we need, in fact, is an even wider mobilization against the massive mobilization that the Nazis, these outcasts, seek, but in a reactionary basis. The set-up, in every square and neighborhood, of people’s kitchens -which were until now organized mainly by anarchists-, people’s dispensaries and teams for legal help, would play a crucial role during the hard autumn that is coming. But all this are not enough, what we definitely need is the organization of antifascist base groups as well, which will cancel the stabbers plan to win in the street. And these groups can only be created with a collaboration between all the dynamics which are taking active part in the antifascist struggle. The street needs coordinated action, not ideological purity. 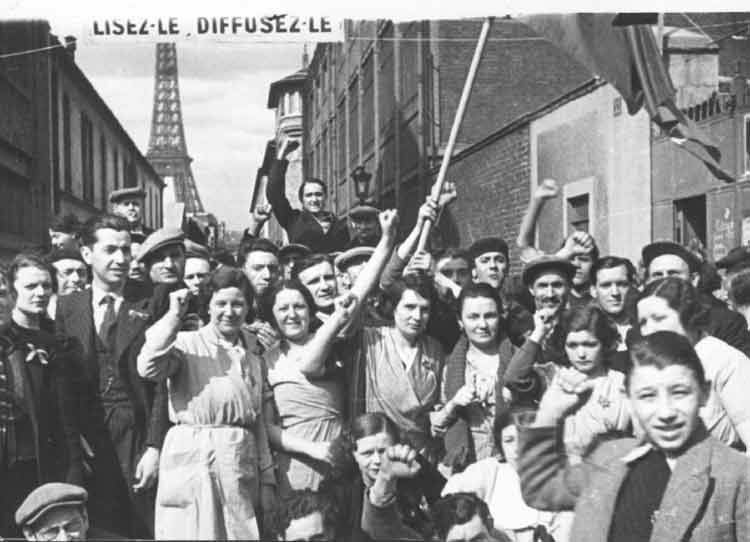 Images: United Antifascist Front, early 1930’s Germany; Front Populaire, France 1936 . So firstly what the already established antifascist forces need to do is to communicate without delay in order to coordinate their actions both in local and in central levels. Obviously there are different opinions and preferred strategies, but the most important is the multiple common grounds, as the common need is now pressing. It is vital for the antifascist forces everywhere to collaborate within the frame of localized movements and not to remain scattered. And it is also needless to say that, for example, in the manifestations of the ‘Movement United Against Racism and Fascist Threat’ (KEERFA), people from the ‘Movement to Deport Racism’ should be invited to speak and vice versa. However, it is of high significance that the leadership of these movements will communicate with anarchist antifascists and with the rest of the Left as well, in order to create in time a united front able to keep up with the challenges of today. 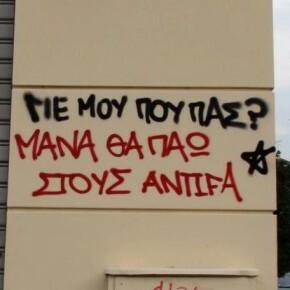 Excuses such as “some belong to ANTARSYA, others to SYRIZA (Coalition of the Radical Left), while others are anarchists”, or that “the antifascist coordination should be viewed according to the occasion”, indicate a major lack in the problems’ understanding. I hope that the leadership of the antifascist movements will not give further time for unhindered organization to Golden Dawn and the state. Finally the mentality of common mobilization and victory has to prevail, instead of the separatist guarding of one’s own space, the grave outcomes of which we all witnessed in the case of KKE (Communist Party of Greece). Here we could take an example from the experience of movements in other countries, especially of those who managed, in fact, to beat the fascists. Such an example comes from the United Kingdom, where the International Monetary Fund and Thatcherism created a social and political polarization, in 1970-1980. The nazi ‘National Front’ had practices, powers and influence similar to Golden Dawn’s today, which was empowered by a much wider voters pool of racist far-right wing, which was established by leading members of the Conservatives such as Enoch Powell. But it was crushed by the Anti-Nazi League (ANL), a front organization of the Left, established with the initiative of the Socialist Workers Party (SWP), which did an exceptional work in the football stadiums, the streets and with the youth and which organized movements that signaled those times, such as Rock Against Racism. It is fairly suggested that without ANL the United Kingdom would get its own Lepen much earlier than France. In the 1980’s, the Anti-fascist Action(AFA) continued the work of ANL. AFA organized streets actions with military discipline, guided by an open central committee, which included many groups of the Left and anarchists. They were framing their struggles focused on the amazing book entitled “Beating the Fascists“, by Sean Birchall, (Sean Birchall, Beating the Fascists. The Untold Story of Anti-Fascist Action, Freedom Press, London, 2010), which was written from an anarchist perspective. It is a book worth reading , along other ones that give a contemporary understanding of what fascism is and how it can be defeated. Fortunately translated into Greek, a nice study that encapsulates the experience of the first phase of post-war fascist movement in Britain, is “Never Again”, by the historian Colin Sparks (Colin Sparks, Nevermore, Movement Deport Racism, Athens 2011 . Sparks was an active member of ANL, just like Dave Renton, another great historian, whose study “When we touched the sky. The Anti-Nazi League 1977-1981“, which must be urgently translated (into Greece) (David Renton, When We Touched the Sky: The Anti-Nazi League 1977-1981, New Clarion Press, Cheltenham 2006). And of course, people who are interested in acquiring a more comprehensive theoretical understanding of fascism, have to first read the composition of works of the great historian Robert Paxton (Robert Paxton, The Anatomy of Fascism, Cedar, Athens 2006), which is unfortunately out of print, but is relatively easy to find an online pdf version. The short and well-written book by Sparks requires a comprehensive and figurative analysis of four battles of the Left against fascism; two that were lost (Germany and Spain in late 1930’s) and two that were won (Britain in the decades of 1930 and 1970-1980). He examines strategies and he proposes policies/tactics against fascism. One important finding is that the struggle against fascism is based on three pillars, which all three must be equally taken under consideration. You cannot neglect any of them. 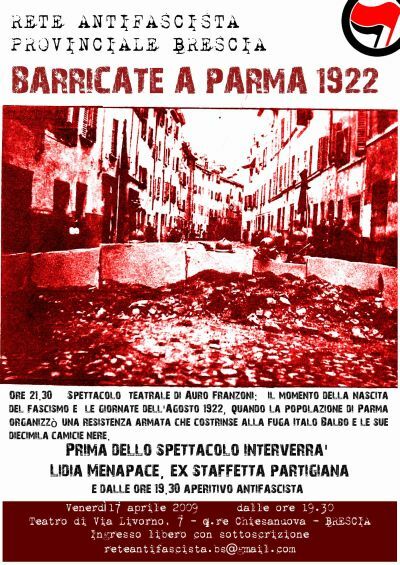 The first pillar is the refutation of the fascist slogans and propaganda, the battle for the mind and heart of the people, who in times of crisis are alienated by the system, but not automatically directed to the Left. The second pillar is the massive mobilization: the battle against Golden Dawn must mobilize all available mass organizations, from the trade unions and local authorities, to scientific and parent associations. The third pillar is the necessary control of the streets. There is no historical example in which the Left defeated fascism without organizing to conquer – against fascists and forces of repression – the public space. Nazis must be persecuted off the streets, and this is not done with prayers, but with militant organization. All those who imagine that fascism is dealt with activities of cultural snobbery or sermons of non-violence should remember how much their perceptions formerly helped the rise of Hitler and Mousolini, and how decisively they – unfortunately – contributed to the outbreak of the Second World War. The ideal exponent of this was Chamberlain, the chump British prime minister who promoted the policy of ‘appeasement’. Unfortunately, we have many Chamberlains among us . Until recently, the Left, with the main exemption of KEERFA, abandoned the anarchists alone in the battle of the streets. The leaders of SYRIZA and the Communist Party turned a blind eye to the problem of fascism, and unfortunately they left, despite our persistent requests, the snake to be hatched in Agios Panteleimonas – now crawling all over Greece. 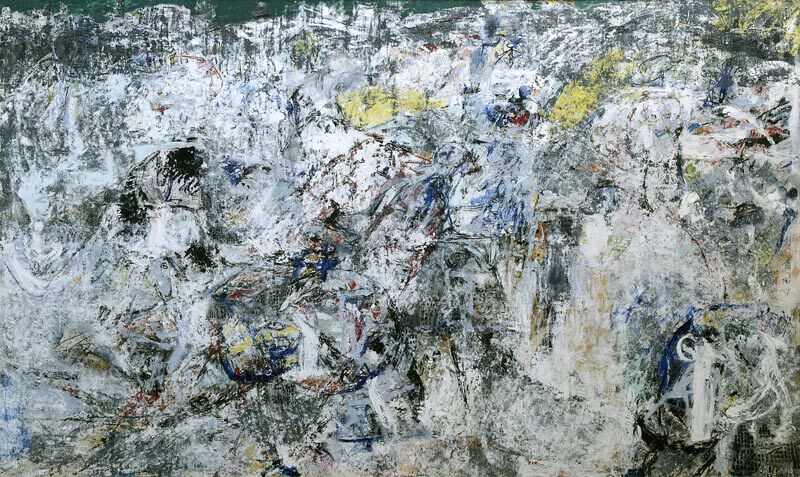 Their blindness was partly due to their inadequate theoretical background; until recently, they had no oversight of the crisis of late capitalism, all the more so of fascism. 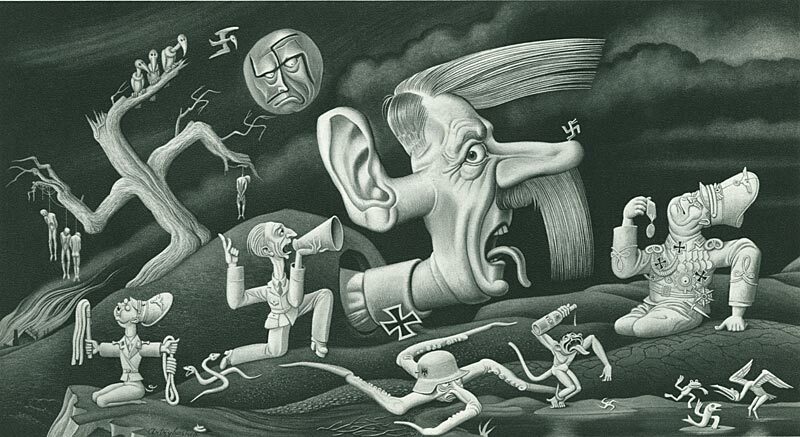 Some had remained in Poulantzas’ analysis of the rise of fascism, others in that of Dimitrov. Quite importantly however, this was also caused by their standard fear for mass mobilization, in which they never pioneered, despite all the pressures they were receiving from their own base, in which they were supportive only when they were hoping that they could mitigate or control it. But the Greek people have now entered irrevocably into an orbit of mobilization and is up to us whether they will head towards the Left or towards the far-right. hardly touches them. Furthermore, what SYRIZA and the KKE mumble on unemployment, does not excite anyone. however, it is not what the Left says to them today. What it would, in my opinion, say to them is that it can solve – and will actually solve- the problem immediately. But it will do that not in a way conceived by its leadership. The same leaders that a couple of years ago considered the crisis as a communication trick of capitalists, a year ago refused to talk about the debt, and nowadays still consider the option of the drachma as destructive. These leaders do not ever bet on mass mobilization, which is essential to any real change. it will have created the appropriate administrative infrastructure. Yes, we are talking seriously about hiring one million within two years to make unemployment disappear. Such needs exist, as we urgently need adequate nurseries, nurses and social workers, teachers and doctors, forest rangers and cleaners, and all sorts of people that are able and willing to offer to the public good. Despite bankers and neoliberals, we should rise the numbers of people working from the public sector from 670,000 today to 1,670,000 in two years. But do we have money for that? An honest Left would surely answer that there’s no lack of money, as it is lying in the pockets of the rich or it is given to bankers and other mafia bosses that feast on public property. The taxing of the rich, the abolishment of tax reliefs for the capital, and the socialization of banks, services of public interest and the strategic industries are enough to finance the disappearance of unemployment. Additionally, there’s the solution of budget deficits, backed partly by internal lending and partly by printing money, which causes only a small danger of inflation in the current situation where the labour force is not fully employed. If the majority of the newly-hired is payed 1000 euros monthly (or maybe soon its equivalent in drachmas), an amount which unfortunately sounds good, then the total annual cost of the job position, including the insurance fees, the taxes etc. is around 20.000 euros. The total annual cost for the employment of half a million people is approximately 10 billion; the employment of 1 million people, which would completely eradicate unemployment, costs 20 billion. In reality it is much less, because the cost of (unemployment) benefits will be dramatically reduced, the pension funds will revive, several more job openings will be created in the private sector and, while pushing salaries up, active demand will be improved, re-enforcing state finances as a result of a chain reaction. In other words, the final solution of what is considered to be the main problem in the society costs much less than one tenth of the GDP (officially, 227 billion euros in 2010), and also much less than the money spent by the state in paying interest to loan sharks in 2011 (17 billion). Less than what the state pays in serving the public debt within a trimester (around 70 billion annually), and much less than one tenth of what we gave since 2008 to bankrupt bankers (a total of 218 billion, according to the calculations of analyst Panos Panagiotou). Finally, it costs less than the increase of debt of the central government only during 2011 that was caused by the catastrophic policies of the governing parties (19 billion) or the reduction of the GDP in the last three years (20 billion), that was caused by the same policies, and not more than the net amounts sent abroad every year by foreign capitalists (more than 10 billion in interest, stocks and profits). We must speak openly and loudly about all of these to the puppets of neoliberalism, that will soon try to recover from the euro depression. There’s no shorter way in redistributing the wealth in favour of the lower classes, or the restarting of the economy. It’s not a communist measure, Roosevelt did much worse in the USA during the 30’s, but it absolutely changes the social relations radically in favour of labour. The current massive unemployment is not an economic necessity, it is a political choice. It becomes easier for those who rule because of the lack of left voices today. Moreover, it incredibly simplifies their plan, to impose social cannibalism, through Golden Dawn. If all of this are going to happen, we first need to remove the current government and turn the network of power upside down; if we don’t do all this now we shall never do it as long as we live. The absorbance of 1 million employed is good old-fashioned Keynesianism, even though the financial brains of the old left are afraid to even imagine it. It’s meaning will naturally change if it is accompanied by the measures we keep repeating – denying the debt, exit the eurozone, nationalization of banks, control of the movement of capital and labour etc. Even all these are not enough; changing the course of the country needs to be validated in a symbolic manner. The previous time, the tombstone of Nazism fell in Nuremberg. In the same city that was used by Hitler in order to demonstrate the power of the Nazis, and where the racist laws of Nuremberg had been proclaimed, the allied powers that won the World War II judged from 1945 to 1949 more than one hundred members of the Nazi regime. Apart from the Nazi leaders, many of whom were sent to the gallows, senior judges, doctors, soldiers, para-state officers, propagandists, and others involved with the Nazis was sentenced to heavy penalties. According to the Principles of Nuremberg, war crimes that are punishable under the international law included, among others, the abuse, or the forced labor of citizens of occupied countries and the plunder of public or private property. The murders, enslavements, deportations and persecution based on political, racial or religious criteria, were characterized as crimes against humanity. It was also assessed that the orders from superiors could not be considered as mitigating factors. These principles can also be applied in the humanitarian crisis of Greece and other countries in the European region, and may not be long before the time that will be used against those who brought us to the current situation. As soon as the sovereign regime will be overthrown, through elections or through a people’s uprising, the time of catharsis will come. First of all, a Committee of Finance and Account control should come at work, so that the Greek people will learn how and why the debt that legalized bankruptcy and their enslavement, was created. This will establish beyond any doubt that the debt is odious and neither should, nor could be paid, especially in the framework of a state of emergency in which the ridiculous choices of Troika and the government threw us into. But eventually, in order to finish the sad chapter of the Memorandums and the antidemocratic aberrations, something similar to the trial of Nuremberg will be necessary . So that, finally, everyone responsible will be held into account: the politicians responsible for the destruction, the Neo- Nazi leaders, the bankers and the capitalists who finance them, along with the controllers of the mainstream media that spread hatred and divide the people. The regime is vulnerable, and even more vulnerable is Golden Dawn that is preparing to stand in between the people and the helicopters. But if it is not confronted systematically and in time, it can really soon become a very dangerous enemy. It will not disappear by itself and will not be defeated unless we work vigorously for that purpose. The lost time must be earned back. And the historical memory must be revitalized, not only with regards to the victims and crimes, but also with regards to the punishment. The area of Agios Panteleimon was for a long time a place of attraction for immigrants mainly from the countries of Asia and Africa. In the spring of 2009, were burst out tensions between the locals and the immigrants . These tensions led to the intervention of the state which is continued until now. Moreover, according to the United Nations High Commission for Refugees, in this area there have been noticed many instances of racist violence. No, the particular graffiti is in Athens, at one of the ‘trilogy’ Buildings at Panepistimiou street, the old University.